EZ View Med Bag, manufactured by Hopkins Medical Products, is a medical equipment bag that's ideal for clinicians that greatly prioritize organization. 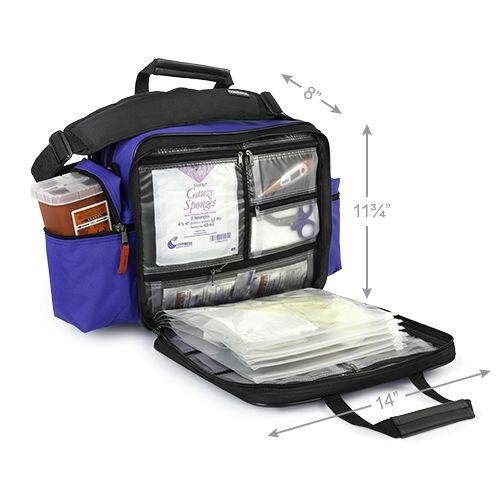 To prioritize organization, this medical tote features three primary compartments with two fold-down subdivisions. 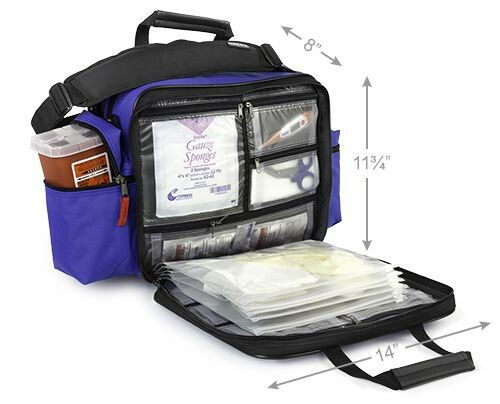 Each subdivision integrates 12 transparent pouches to make managing your doctor supplies easy. In fact, the pouches will keep all of your supplies separate, uncluttered, hygienic, and easy-to-locate. In addition to the subdivisions integrating transparent pouches, the compartments integrate six transparent zip-lock bags to securely store medical dressings, gauze rolls, and more. The zip-lock pouches are securely held in place by a four ring binder, so you can be certain that they will not easily fall out of its storage. To elaborate on storage, one of the side pockets is even large enough to safely and securely store a 1 quart sharps container, separating it from the rest of equipment as required by OSHA. Equally important to being OSHA compliant is being HIPAA compliant. The EZ View Med Bag integrates a patients' records pocket on the front with lockable zippers. If you desire enhanced security, you can order this medical tote with a combination lock, too. Allows you to easily locate equipment. Available with or without a combination lock for enhanced security. Can safely hold a sharps container. Four ring binder that securely holds transparent pouches. Perfect for clinicians that greatly prioritize organization. Spacious compartments and subdivisions to store medical equipment. Product Numbers: 532020, 532030 and 532020ROYCA.